1-night rental year-round —stylish and romantic great location! Staying in this Frank Lloyd Wright style home will make you feel you are living your getaway in special style. Designed and built by a man who used to push off the Firefall in Yosemite, the Mountain House is a wonderful blend of simplicity and artistic style, with rock, glass and wood to set the mood. Those who love Yosemite and the mountains will love this small and unique house. The kitchen, bathroom and living room have been remodeled and upgraded in 2016/17. 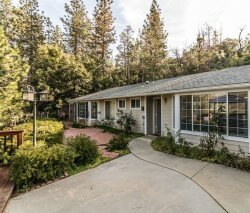 Although located near the heart of Oakhurst, the setbacks, size and location of the property make it feel remote and private, with towering trees, a seasonal creek and wildlife and birds to entertain you out the dramatic windows. Yosemite National Park entrance is only 16 miles away, so you can enjoy it's wonders during the day and return to Oakhurst to sample the variety of restaurants (ranging from 5 star to pizza), enjoy the wineries, beer pub and art galleries, shopping, zip line, golf courses, historic attractions or gambling at nearby Chukchansi Casino. Bass Lake and Sierra National Forest, only a few minutes away, also offer a wide range of opportunities for water sports, hiking, picnics and other fun. Simple in construction and design, the house has a peaceful and unique feel that will make your stay extra special. Large windows cover one entire wall, looking out over towering oak trees and the creek. Open beams and natural rock walls and accents give the house a special ambiance. An indoor garden graces the hallway. Lighting fixtures accent the rock and fine art on the walls. Natural and open, this house surprises and pleases those who spend time here. A small but fully functional kitchen (complete with all new appliances and new pots/pans) is partially open to the dining room and living room, making food preparation easy if you decide not to use one of Oakhurst's many restaurants. The master bedroom has a wonderful king sized Temperpedic bed, lovely windows and nice wooden furniture including a desk. The (very) small second bedroom has a fold out couch to make a double bed and a nice big window to let the sun shine in. The newly remodeled bathroom has a tub/shower combo, and is equipped with handrails for safety and ease. Cabled wifi, 42' flat screen TV, dvd/vcr players, games, binders of local information, guide books, coffee service and a nice variety of herbs and spices are among the many amenities here. This house was built by a long term Yosemite National Park resident and it has stayed in the Yosemite family for 40 years. Art and photography by Yosemite artists hang on the walls, and a fabulous binder filled with local knowledge about the park and surroundings will be available to enhance your visit. This house is wonderful for two people, although it can sleep another couple or child in the fold out double bed in the very small second bedroom. The house is not appropriate for young children. No pets. they were fine & helpful. This property is lovely. The architecture is simple & appealing, both inside & out.Totally Frank LLoyd Wright in style! Rockwork in the interior was beautiful & I learned it was built by the owners father, and paintings on the wall of Yosemite were done by her brother,just beautiful! The open expansive windows look out to a natural garden with visiting quail & other birds, deer & small critters~you know you're in the mountains when here. We enjoyed sitting peacefully in the yard with refreshments after a day of adventure watching the light change in the trees & sky. This pretty, clean, simple house had everything we needed. You should stay! AMAZING HOUSE!! All the details were perfect, so cozy. Thanks for the stayhope to come back soon. Home was extremely clean and the staff was very knowledgable and helpful. My husband and I loved our stay in the Mountain House--this unique little house is wonderful, very clean, well stocked and the bed is really comfortable. We really enjoyed looking at the creek in the back and watching the birds and wildlife after returning from our visit to the park. It is a great place with a very interesting Yosemite connection--we will be back and would recommend it to our friends.